PDF Page Size Split is an Acrobat plug-in tool for full commercial version of Acrobat which is used to split pdf pages on page size, so for example you could have a PDF with 15 pages of A3 and 5 pages of A4, PDF Page Size Split will split the pdf into two files:- one for A3 and one for A4 pages, then you can print all the A4 pdf's without interruption or store them away in your archives on page size, this also makes viewing pdf's much easier. An optional matching size table is also included that matches metric size to the ISO standard paper size, for example: 210x297 is A4, you can also specify your own custom sizes & size ranges, the ISO name is then appended onto the output filename so you can later quickly find your documents without knowing all the ISO metric paper sizes & your custom size descriptions. Split and merge PDF documents, and edit PDF document pages. A unique utility designed to split, merge, and manage your PDF files. PDF Split Merge is a handy and user-friendly PDF tool for splitting and merging. 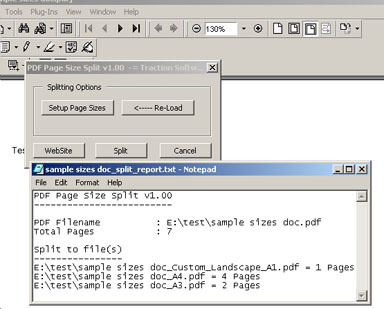 Free Pdf Splitter is a handy or user-friendly PDF tool for splitting merging. Qweas is providing links to PDF Page Size Split 1.02 as a courtesy, and makes no representations regarding PDF Page Size Split or any other applications or any information related thereto. Any questions, complaints or claims regarding this application PDF Page Size Split 1.02 must be directed to the appropriate software vendor. You may click the publisher link of PDF Page Size Split on the top of this page to get more details about the vendor.